Proceeds from programs and guest room & board generate most of the income needed to cover the Ashram's operating expenses. However, we depend on the generous support of our friends and members for the additional income needed for operating, as well as to help us maintain and improve our infrastructure and expand our facilities. We hope you will join us for some of the special celebrations and programs scheduled this season. 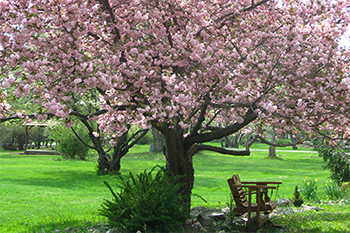 Help keep the Ashram beautiful - contribute to the Tree Fund! - Donations to this fund are being utilized to pay for our new teacher and guest house, the Shanti Sadanam. 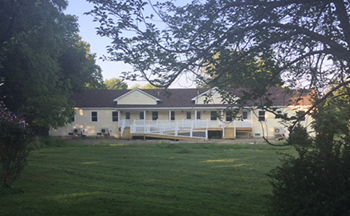 Housing has been one of Ananda Ashram’s greatest needs, and your generosity will benefit the people who visit here for many years to come. It is the largest capital improvement project in Ananda Ashram’s 54-year history. The building is now open to teachers and guests and is designed for 12 bedrooms with the capacity to add additional bedrooms in the future. - Money contributed to the Ashram Fund is utilized to support the areas of Ananda Ashram's greatest needs, including maintenance and beautification of our buildings, grounds and roadways. It can help to cover the costs associated with the daily operations and guest services such as utility bills, etc. Donations to the Tree Planting Fund will be applied to the purchase of trees, deer fencing and fertilizer. If you would like to Sponsor a Tree for a loved one, make a donation of $200 or more and email anandahumanresources@gmail.com with dedication information. Donations to the Tree Removal and Maintenance Fund will assist in the removal of dead trees near buildings as well as the trimming and pruning of trees. The clearing of dead trees allows for new plantings. • The Yoga Society of New York, Inc., is a 501(c)(3) nonprofit tax-exempt organization. Your gift is tax deductible to the extent permitted by law.